Deploying Windows Server 2012 R2 in Dual-Boot Configuration using Windows 8.1 Native Boot-to-VHD capability | Chinny Chukwudozie, Cloud Solutions. 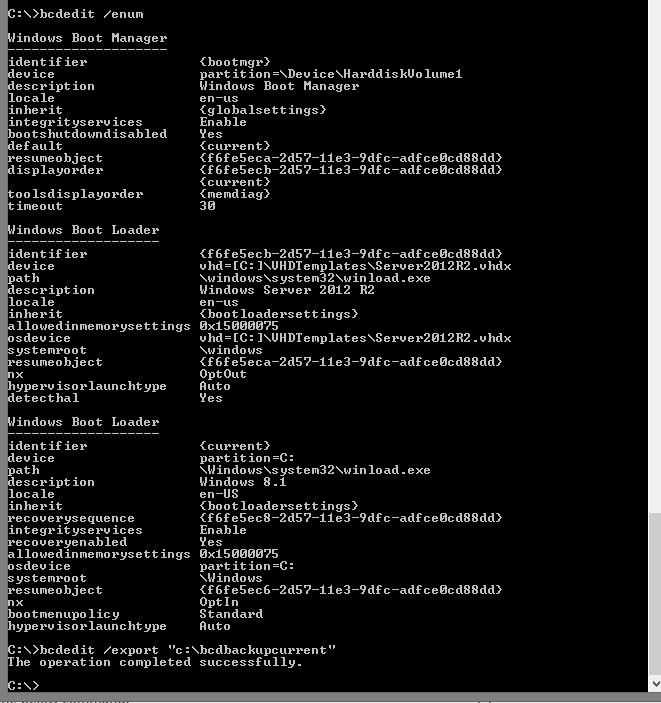 Create a WS 2012 Server VM. I already have Hyper-v and it’s management tool installed on my Windows 8.1 OS Laptop. Using Hyper-v manager, I created a new WS 2012 R2 VM using an already existing WS2012 R2 iso. After the VM creation and Windows Server 2012 OS install, I shut down the VM and copied the VHDX file to the root folder: c:\vhdtemplate\server2012r2.vhdx. Now I have a working WS2012 OS VHDX file. 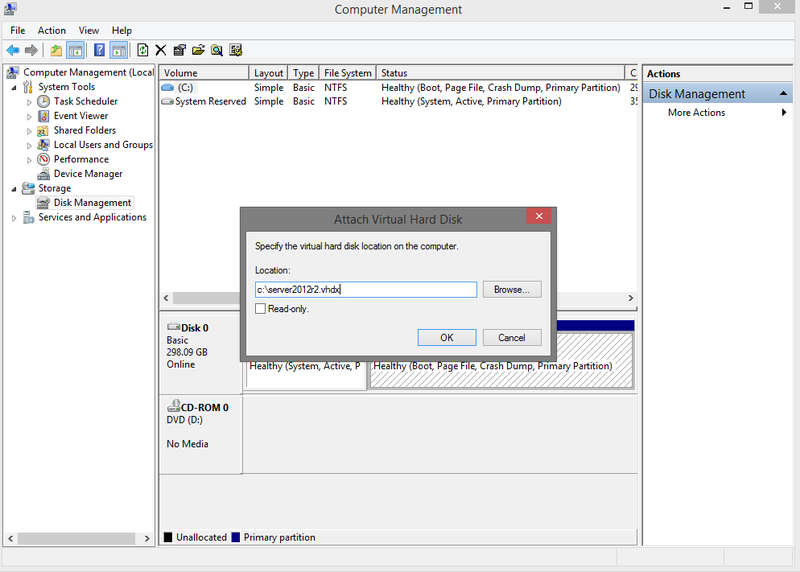 I’ll go ahead and open Computer Management console, browse to and right click the Disk Management command on the left pane, select the Attach VHD option, browse to the location of the c:\vhdtemplate\server2012r2.vhdx and attach the file. 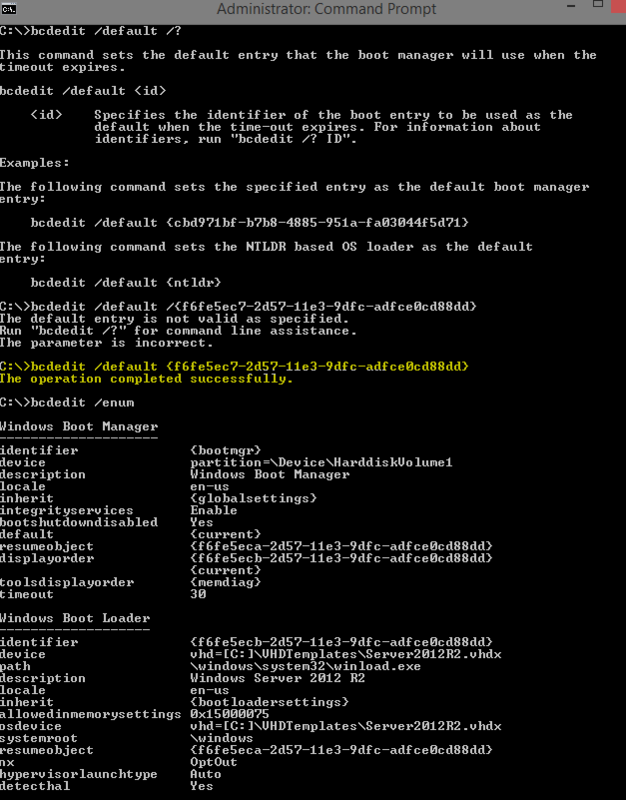 Open a command prompt as an administrator and use the following Bcdboot command to create a new boot store: Bcdboot f:\windows. Where f: is the mounted vhd file drive. I started by creating a backup of the current data store configuration: bcdedit /export “c:\bcdbackup”. Use the bcdedit /enum all/v with the /enum and /v switches to enumerate the available boot loaders and retrieve the unique identifiers in full of the Windows 8.1 loader. To test your new dual-boot configuration, I restarted the laptop and selected the “Windows Server 2012” boot option. 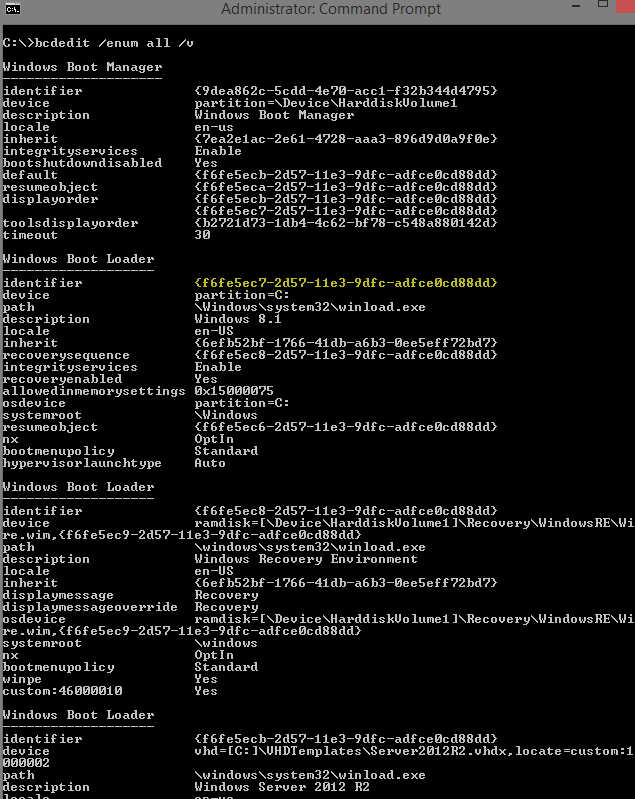 I observed that the “Windows 8.1” boot option is the default as configured using the bcdedit tool. During the first-time boot sequence, Windows Server 2012 R2 attempted to locate the appropriate device drivers for my laptop hardware. Depending on your computer hardware configuration, one or more reboots may be required during this initial configuration. Each time your computer reboots, select Windows Server 2012 as your boot choice. After the initial setup and hardware configuration process, I have a fully functioning WS 2012 R2 machine to work with. At this point, I installed the Hyper-v role and setup a Server Virtual Machine to as a Server 2012 R2 Domain Controller. In a later post, I will talk about installing and configuring the Active Directory Domain Service in WS 2012 R2. This entry was posted in BCDEdit, PowerShell, PowerShell 3.0, VHDX, Virtual Machines, WIndows 8.1, Windows Server 2012 R2 and tagged BCDBoot, boot-to-vhd, vhdx, Windows 8.1, Windows Server 2012 R2. Bookmark the permalink.